First reported in "The Grocer" and now we've tried it too, raw butter is available in Waitrose - Isigny Sainte-Mère butter. 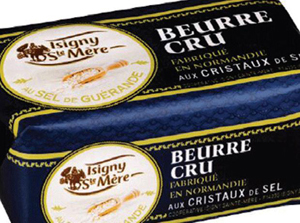 French diary co-operative Isigny Sainte-Mère secured a place for its unpasteurised raw butter for the first time in the UK in July 2012. Their export manager told the trade press how popular raw butter is in France. It was a gold medal winner in the Concours General Agricole 2012 competition in Paris, and we can confirm it is absolutely delicious. This is a huge step for raising awareness on raw dairy which has many health benefits. "Raw", unpasteurised butter has not been heat treated, and as such retains many wonderful nutritional properties that are destroyed in the modern milk process. Contrary to what some might say, it is totally safe and exceptionally healthy. It is interesting to note that those who have a lactose intolerance, often find that raw milk and butter suits them perfectly well. Pasteurised dairy has also been linked to a number of other health issues. Here in the UK, there is massive growth in demand on unpasteurised (raw) dairy. We wholeheartedly support this because of the nutritional benefits, and send out information with our orders on a raw milk supplier who deliver nationwide - www.hookandson.co.uk they do also supply raw butter. There are also a number of farms who supply direct to the consumer "at the gate". All farms that supply raw milk are licensed by Defra, and have to go through extremely strict safety procedures. One note, it is very important that raw dairy is organic, although this is also true of pasteurised. Raw dairy is also unhomogenised (sometimes available in supermarkets but few and far between). This process is a curious one, and exists to make milk consistently the same top to bottom of bottle by smashing up the fat proteins so they spread evenly rather than forming "inconvenient" cream at the top! But this process causes damage to the nutrients and the fat cells have more casein - this itself may cause milk allergies. You may also like to see the Butter Oil from Green Pastures. This is an incredible supplement that condenses the nutriitonal power of raw butter, and was written about by noted researcher Weston A Price. Read about the X-Factor Butter Oil here. There is both a salted, and unsalted version available in Waitrose, and here's some even more exciting news, the salt they use is none other than the wonderful Celtic Salt from the Sel De Guerande. This is a healthy salt absolutely packed with minerals, and that's why we sell it as a wonderful health supplement (yes, you read that right!) and you can read more HERE. What About the Saturated Fats? Forget the media nonsense about saturated fats and butter in particular. It is one of the healthiest foods know to man, packed with nutrition, and you can read more in our article - Butter or Margarine?